This recipe is not as difficult to make as it looks, and once you’ve tasted it, you will make it often! See the recipe for Pear, Almond and Chocolate Parcel for the dessert version of this recipe. 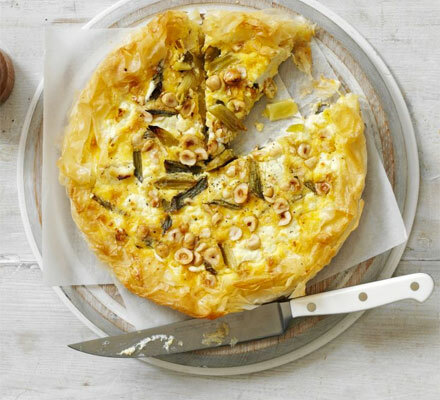 Quiche or savoury pie makes exceptionally good light meals, starters or side dishes. A basic crust and custard are used, while the ingredients are variable, e.g. spinach and feta quiche, pear and blue cheese quiche, etc. 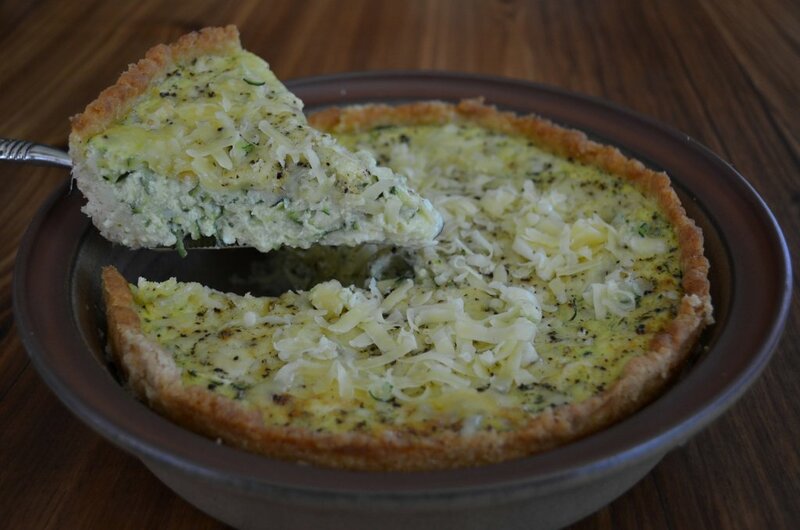 Quiche is a classic French dish. It consists of a open-faced pastry crust with a filling consisting of a savoury custard base and variable ingredients such as cheese, meat, seafood, and/or vegetables. 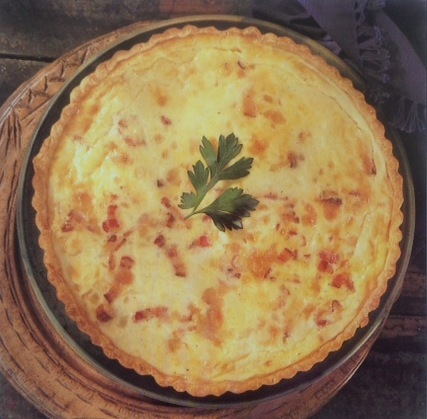 Quiche Lorraine does not contain any cheese and is named after the Lorraine region of France. Preheat the oven to 180 °C and grease two 22 cm pie dishes with butter or non-stick cooking spray. To make the pastry, place the dry ingredients and butter into the bowl of a food processor and process on pulse until crumbly. Add the water a few drops if necessary until the pastry holds together and is neither dry nor sticky. Knead the pastry gently on a floured surface just until smooth. Press the pastry into the pie dish and cover evenly over the base and sides of the dish. Refrigerate the pie dish while making the filling. To make the filling, beat together the cream and milk and add the eggs and seasoning and set aside while preparing the filling. Spoon the bacon evenly over the crust, pour the milk and egg mixture over the bacon. Bake for about 30 to 40 minutes or until pale golden and firmly set in the centre. Serve warm with salad or allow to cool, cover and refrigerate until required. Recipe by Carolié de Koster from Art Of Cooking p. 638. 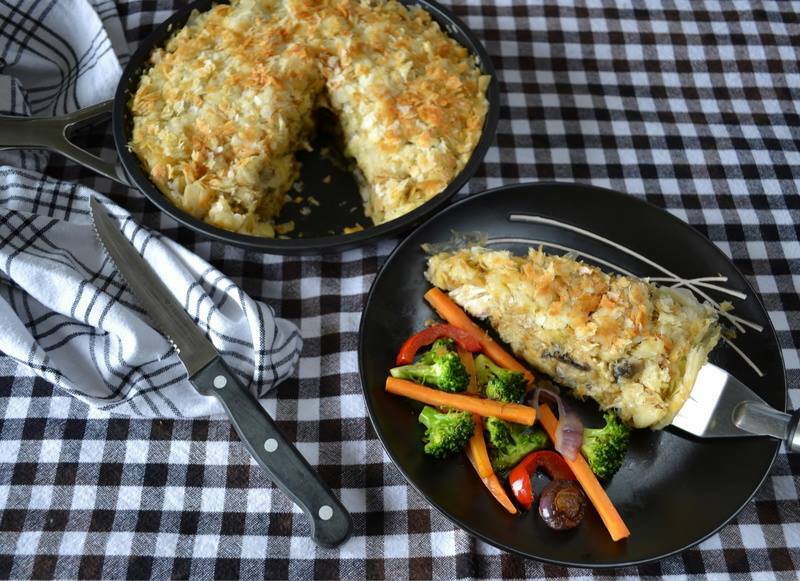 An idea with a savoury pie to stand in as an any time treat served with salad, as a delightful vegetarian meal or side dish with grilled or braaied meat or fish. Place the flour, salt and butter or margarine into a mixing bowl and rub together until fine crumbs form. Make a well in the centre and add the egg yolk and a few drops of water. Mix with a fork, gradually adding a little extra water until the dough holds together. The dough should be soft but not too sticky. Knead the dough very lightly only until a smooth dough results. Grease a 26–28 cm pie dish with margarine and press the pastry evenly into the dish. Shape the edges neatly, pressing it down with the fingertips to thicken the pastry at the edge and refrigerate while the filling is being made. Place the Ricotta cheese, whole eggs, egg white, mustard powder, salt and white pepper into a bowl and mash well with a fork to soften the cheese. Add all remaining ingredients except black pepper and beat with a whisk until combined. Pour the filling into the crust, sprinkle with black pepper to taste and bake at 180º C for about 35 to 40 minutes or until golden and set. Serve warm from the oven or at room temperature. Replace Ricotta with cottage cheese or 100g/125ml additional Cheddar cheese. Cheddar cheese may be replaced by Tussers, Lichten Blanc or Edam. For an onion pie, replace the baby marrow with 2 onions, sliced into rings or coarsely chopped and sautéed about 5 minutes in butter or margarine until limp. If preferred add about 100g shredded smoked salmon or ham to the onion filling mixture as given in step 3. Recipe by Carolié de Koster from the Art Of Cooking p. 394. 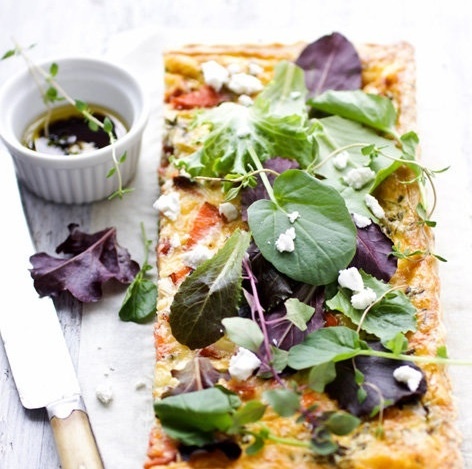 This tart can be served as a starter or as a light meal with salad on the side. Place a baking tray in the oven and heat the oven to 200 ° C.
Brush the melted butter on the bottom and sides of a 23 cm round, loose-bottomed tart tin. Line the tin with a sheet of phyllo pastry. Brush the melted butter over the sheet and cover with a 2nd sheet at a different angle so that the base and sides of the tin are well covered. Allow the pastry to drape over the sides. Heat the oil in a pan, add the spring onions, garlic and some seasoning, then fry for a couple of minutes to soften. Remove from the heat. Whisk together the mustard, crème fraîche and eggs in a measuring jug. Scatter half of the spring onion mix and half of the goat’s cheese over the pastry base, pour over the egg mixture and top with the remaining cheese and spring onions. Sprinkle over the hazelnuts, then fold in the overhanging pastry and brush with the remaining butter. Bake the tart on the heated baking sheet for 25 to 30 minutes until the filling is set and the pastry is golden. Carefully remove the pastry from the tin before slicing. Mix with a fork, gradually adding a little extra water until the dough holds together. The dough should be soft but not too sticky. Knead the dough very lightly only until a smooth dough results.